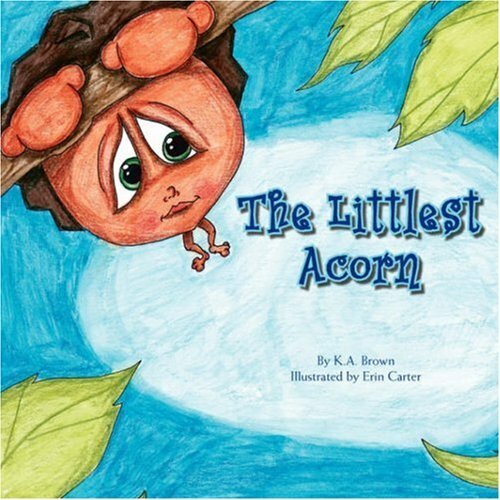 Arty is a little acorn hanging from the branch of his father a giant tree in the backyard of a young boy. All the little acorns were happy when their time came to fall to the ground. They knew that falling would take them on a wonderful journey. They could help the animals stay strong and healthy in the winter, or they would be made into a beautiful necklace for a young boy’s mother. Some would play with the squirrels and roll around the ground like a ball. But Arty was too afraid to let go of the branch. He wanted to know what would happen to him. His brothers and sisters tried to convince him to let go, but he wouldn’t. He clung to the tree and soon was all alone. The big oak told Arty that the young boy was moving away and that he would miss him climbing and tickling his bark. The big oak also tells Arty it is time for him to find his destiny. He breaks the branch and Arty floats to the ground and falls on a pile of leaves. The young boy discovers him and Arty is taken to his new home and planted. Arty’s destiny is to become a giant oak like his father. This is a great story for parents and teachers to share with young children in discovering what they can do and what they hope to be when they grow up. It will open up dialogue for parents and teachers to educate young minds on the possibilities of what they can be and not to be afraid.